Description The Memorial is located in Lady Bird Johnson Park, a Potomac River island in Washington, D.C. The grove consists of two parts. The first area, commemorative in nature, is a granite monolith surrounded by a serpentine pattern of walks and trails. The second area is a grass meadow and provides a tranquil refuge for reflection and rejuvination of the spirit. The trails are shaded by a grove of hundreds of white pine and dogwood trees, and framed by azaleas and rhododendron. 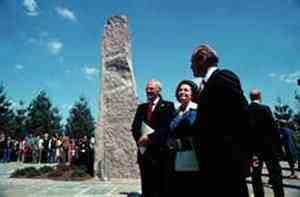 Add Lyndon Baines Johnson Memorial Grove On The Potomac to your free online travel itinerary.